Corentin is a scholar with a secret—his magical Talent allows him to turn into a dragon, and he isn’t alone in that ability. Long ago, dragons were hunted fiercely, until they went into hiding, becoming things of legend. Corentin has traveled the world with one aim—to protect his people and keep their secret safe. Drawn to the principality of Tournai by news of someone close to discovering that secret, he hopes to avert suspicion. His attraction to the too-serious Bastien isn’t convenient for his purpose, but it isn’t something he can ignore either. Lord Bastien, Earl of Ardesia, inherited his title unexpectedly when his parents were killed in a sailing accident along with the parents of his cousin, Prince Philip. Since then, Bastien has devoted his life to the obligations of his family and estate—so much so, that it has caused tension between him and his siblings. His world is further shaken when he receives an anonymous letter informing him that the tragic boating accident may, in fact, have been murder. Bastien throws himself into investigating whether the allegations are true and finding out who killed his parents. As Corentin and Bastien become closer, the mystery of Bastien’s parents’ death draws him further into danger. Corentin feels compelled to protect Bastien, but the threat is closer than they know. Now, Corentin must decide whether preserving his secret—and potentially his people’s safety—is more important than saving the man he loves. *While this book is the fifth in a series, it can be read as a standalone. and you'd get ready for bed and there you'd be curled up under the covers all snuggly warm with your favorite toy waiting for a bedtime story...maybe, it's a story about kings and queens, fairies, dwarves, elves, a circus filled with lions, tigers and elephants or maybe it's a story with mystical creatures unicorns, griffins, a phoenix...dragons? Whatever, the story as children it was a special time...a time filled with the magic of going to a far away land...a different place and time, filled with magic and adventure shared with just one other person...that person reading the story to us...maybe, it was mom, or dad, a brother or sister or even a grandparent. Whoever it was. It was in those moments that many of us first discovered the magic of books and the wondrous things they have to share with us...the people, places, adventure, mysteries and magic...all of it is magic. Magic that transports us to places and on adventures all without ever having to leave the safety of our cozy, comfortable beds. It's a magic that we get to keep with us our entire lives every time we open a book it's there waiting for us. Ok...so now you're probably kind of wondering what this actually has to do with a specific book...one called 'The Dragon's Devotion'...well, you see this story took me back to my childhood to the magic of fairytales and happily ever after...there was a dragon and yes, we all know I'm a total pushover for dragons but this one...well, I have to say I think Corentin is going to be one of my favorite dragon's ever. He's large and majestic and his scales are such a deep purple that they're almost black, he has beautiful violet eyes. He's fierce and brave and at the heart of him is a man...a man who is intelligent, kind, loyal, handsome and knows how to love. Yeah...I sorta...kinda have a crush on Corentin. But as wonderful as dragon's are they weren't the only thing in this story to hold my interest. There was also Bastian or more accurately there was the mystery that Bastian brought with him...you see for me Bastian was ok, I didn't dislike him. I just wasn't enamored of him. To be honest at times he annoyed me, but I also felt badly for him he lost his parents at an early age and being the oldest child of an Earl, he suddenly had a huge amount of responsibility thrust upon him. Not only was he suddenly the Earl but he has 3 younger siblings that he is also responsible for...two brothers and a sister and it's responsibility that he takes very seriously...read...micro-manage and too serious. But it's done out of a sense of love, responsibility and family obligation...so maybe his course of action wasn't always the best but his intentions were and that definitely counts for a lot. And on a sidebar...can I just say that I was far more interested in Bastian's brothers, Griffen and Mathis...especially Griffen, I think there's definitely a story to be told about that young man and I for one would be so willing to read it...just sayin'. 'The Dragon's Devotion' was a wonderful blend of romance and mystery with a subtle touch of fairy tale for some added magic. The romance was a sweet slow burn...but there was definitely a romance, one involving sweet kisses in the rain, dinner's out with a side of attempted murder...opps, maybe not such a romantic thing...but did I mention...dragon to the rescue? See...what i did there, how romantic is that? Now, just one more thing before I leave on another adventure. 'The Dragon's Devotion' is the fifth book in Antonia Aquilante's 'Chronicles of Tournai' series and as it says in the blurb this one can be read as a stand alone. I haven't read the first 4 books and while I very much enjoyed this one I have to admit I do wonder if I had read the previous books if this might not have turned out to be a 5 star read for me? I honestly can't say for sure, but what I can say is that at no point did I feel lost or confused about this story. I think readers who have read the previous books will probably enjoy it all the more for having the background of some of the secondary characters and while I loved that there were characters from the previous stories in this one, I truly didn't feel like I was missing anything that was relevant to this story so much as that I think when I have a chance I'd like to go back to Tournai and catch up on what I missed by not having read the first 4 books. 'The Dragon's Devotion' is a wonderful story reminiscent of childhood but wrapped in magic for adults. 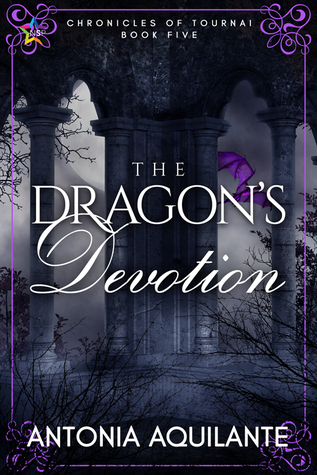 An ARC of 'The Dragon's Devotion' was graciously provided by IndiGo Marketing & Design in exchange for an honest review. Buylinks are provided as a courtesy and do not constitute an endorsement of or any affiliation with this book, author or booksellers listed. Audio book Review: Friendly Fire by Cari Z.